In Spring 2011 I took part in Landscape Photography Workshop arranged by Candy Store, Finland www.candystore.fi. The instructor of the workshop was Martino Balestreri www.martinobalestreri.com an italian photographer living in Radda in Chianti. He runs a photography business in Radda in Chianti, www.lmphotoart.com/eng, Martino Balestreri's photographs are perfectly finished and emotionally evocative. His camera seems to become a bundle of brushes with which he artfully captures landscapes and the play of light, bringing the brilliant colors of Tuscany to life. Various photographic techniques enhance the composition of his landscapes. Balestreri’s landscapes convey his personal vision of renaissance Tuscany, reflecting the mystique of paintings by old Italian masters. His still life compositions emphasize detail, elegance and the use of light, bringing inanimate objects to life. (text from the workshop brochure). 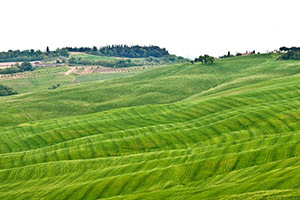 During the week we drove by car and took photos every day in province of Siena, mainly in Chianti, Crete Senesi and Val d'Orcia. In the evenings we looked and discussed about the photographs. We stayed the whole week in Borgo San Fedele www.borgosanfedele.com. Borgo San Fedele is an old presbytery (la canonica di San Fedele). It has undergone a complete restoration and now it hosts conventions, courses, workshops and private ceremonies. Today it is classified as a Historic Residence. In the following links there are the pictures from the workshop. The pictures are mainly "tourist pictures" for myself and other interested to recall and relive the workshop. 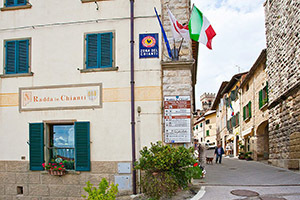 Thursday 28.4.2011 The first day we headed to the nearest town, Radda in Chianti. From there we drove to near villages Vertine and Volpaia. Friday 29.4.2011 More Chianti, Panzano in Chianti, Castellina in Chianti. 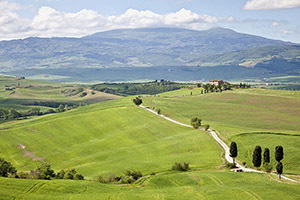 Saturday 30.4.2011 Val d'Orcia and Crete Senesi. Sunday 1.5.2011 We left San Fedele very early in the morning. 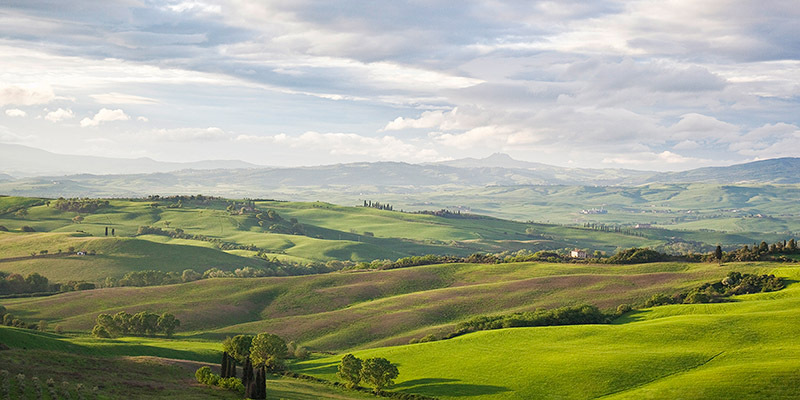 We drove nearly two hours south heading for Val d'Orcia. Near San Quirico d'Orcia we placed our tripods on a gentle southern slope and waited for the sun. After 30 minutes began one of the most rmemorable shows that I have ever experienced. The started climbing into the sky. During the next hour and a half the large valley that was in front of us showed amazing colors and shadows gradually changing. Monday 2.5.2011 On Monday we made a half day trip to Monteriggioni. 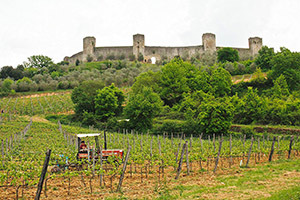 Monteriggioni is small medieval walled town. The rest of the day we had rest and browsed the photos we have taken during the week. Tuesday 3.5.2011 Siena was the nearest bigger city. 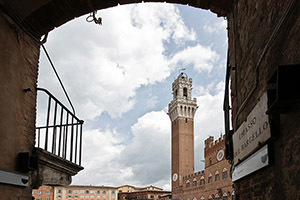 Siena has very long history and if you have not visited Siena, I strongly suggest that you do. It has a lot to offer. The two most famous sights are Piazza del Campo (the town square) and Duomo (cathedral). We made two trips to Siena. The first in the evening and the second in day time. Wednesday 3.5.2011 We left San Fedele in the morning and headed to Pisa from where our flight to home started. 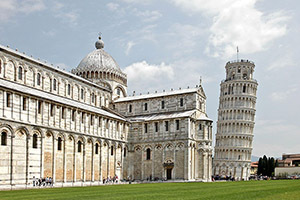 This was my first visit to Pisa and I was of course astonished to see the famous leaning tower. There were a lot of tourists to see the tower. This was a strong contrast to what we had experienced the during the week. 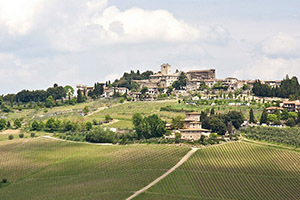 The tranquility of San Fedele and Chianti countryside was totally gone. They were replaced by a lot of people and the hustle and noise. Andrea All the dinners In Borgo San Fedele were prepared by Andrea. Every day Andrea made a three course menu dinner. During the week he presented us typical local dishes. I have always liked Italian food and this also time Andrea's meals were excellent. 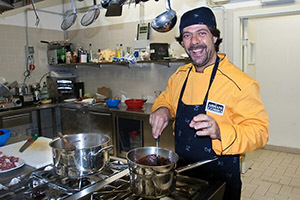 He chooses carefully all ingredients and prepares the dishes with passion and care. All ingredients are organic if possible. And the wine he served in the dinner was also organic. And according to Andrea you can drink this wine as much as you want and the next morning you do not have a headache. Panoramas One of of my interests in the field of photography is panoramic photography. Here are some of the panoramas shot in the trip. Some of the panoramas are near a square. They are however panoramas. The angle of view is more than 100° both in horizontal and vertical dimensions. That makes them panoramas. If you have any comments or questions about the photographs, please feel free to drop me an email at hannu dot lehto at iki dot fi.